“A good city is like a good party—you stay for longer than you plan,” says Danish architect Jan Gehl. He believes that good architecture is not about form, but about the interaction between form and life. Over the last 50 years, Gehl has changed the way that we think about architecture and city planning—moving from the Modernist separation of uses to a human-scale approach inviting people to use their cities. At a time when growing numbers are populating cities, planning urban spaces to be humane, safe, and open to all is ever-more critical. With the help of Jan Gehl, we can all become advocates for human-scale design. Jan’s research, theories, and strategies have been helping cities to reclaim their public space and recover from the great post-WWII car invasion. His work has influenced public space improvements in over 50 global cities, including New York, London, Moscow, Copenhagen, Melbourne, Sydney, and the authors’ hometown of Perth. While much has been written by Jan Gehl about his approach, and by others about his influence, this book tells the inside story of how he learned to study urban spaces and implement his people-centered approach. People Cities discusses the work, theory, life, and influence of Jan Gehl from the perspective of those who have worked with him across the globe. Authors Matan and Newman celebrate Jan's role in changing the urban planning paradigm from an abstract, ideological modernism to a people-focused movement. It is organized around the creation of that movement, using key periods in Jan’s working life as a structure. People Cities will inspire anyone who wants to create vibrant, human-scale cities and understand the ideas and work of an architect who has most influenced how we should and can design cities for people. "This in-depth, illustrated biography...follows the evolution of Gehl's theories as he 'reconquers' cities from London to Sydney with pedestrianized streets, bike lanes, enriched 'edge environments' and more." "A thoughtful tribute to an exceptional urbanist...Read People Cities to be inspired and to learn about Jan Gehl, his great influence, as well as his key collaborators; but most of all, read it to see the world in new ways, with hope for impacting the future, whatever your background or training may be." "A lively, optimistic, and energetic celebration of Jan Gehl's contribution to creating better cities and promoting a calmer, healthier more civilised life." 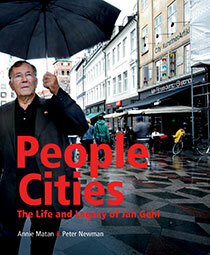 "Anyone interested in the life and legacy of Jan Gehl should read this book...very insightful." "Jam-packed with case studies, testimonials from Jan's colleagues, before and after images and informative illustrations, this ode to Jan Gehl's work makes for a captivating and entertaining read. For people unfamiliar with the work of Jan Gehl, this book provides a perfect overview of Jan's humanistic urban design approach which he has advocated and delivered for over fifty years. For people familiar with Jan's work, then this book will serve as an entertaining 'whistle stop' tour of over half a century of inspiring work."